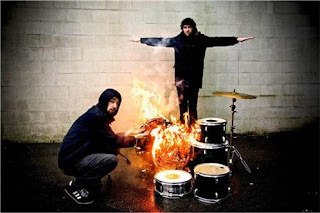 The Canadian rock duo Japandroids consists of Brian King on guitar/vocals and David Prowse on the drums/vocals. They started the band back in 2006 and have since began to gain attention, especially once their debut album Post-Nothing came out in 2009. The guys tend to share vocals on songs and made most of their success happen on their own. Renting equipment, passing fliers, and arranging the shows at venues themselves. In 2008 they considering disbanding their project as they felt it was not getting them anywhere, but in 2009 would be signed to a Canadian label. However, they still were not sure how long they would continue as Japandroids, but continued to play live shows. Their debut gained attention from websites like Pitchfork, praising the album and exposing their sound to a larger audience in the United States. Since then they have not stopped and are planning on releasing another album in 2011. Since forming, they have toured extensively playing some awesome festivals. This would continue to help them generate new fans. Listen to the Japandroids below.